Home > G-sleeve Art > "Being a Kid" Prints by David > "Stargazer"
The "Stargazer" print is one of nearly 100 vignettes drawn from the boyhood experiences of the artist, David Gildersleeve. This book is based on "actual" events. Click image to enlarge. 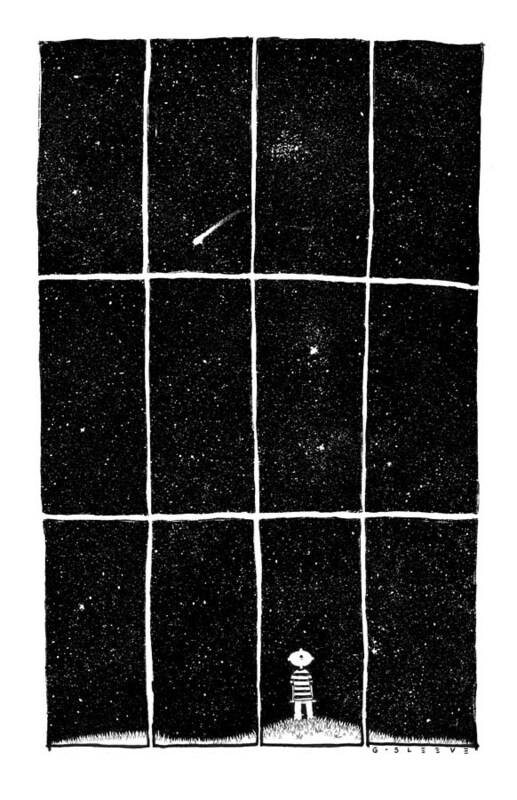 This illustration expresses the wonder of a young boy when he looks up into the night time sky and realizes that the universe is vast and really beautiful, and that his place in the totality of the universe is really very small. And maybe this is when he begins dreaming of the future that awaits him as he grows to manhood. Perhaps he’ll be an astronaut who will explore that infinite space. Maybe he’ll become an astronomer studying the stars. He certainly begins thinking that we might not be alone. What boy wouldn’t be full of wonder when surrounded by a starry night? This print (11" x 17") is foam-core backed and suitable for framing and is perfect for hanging in a boy's room. What boy wouldn't get a chuckle from this look at the world around him. We can't help but think: "I was once that boy!"